Minister Ze'ev Elkin asks the residents of Migron for forgiveness as they remain homeless five years after the demolition. 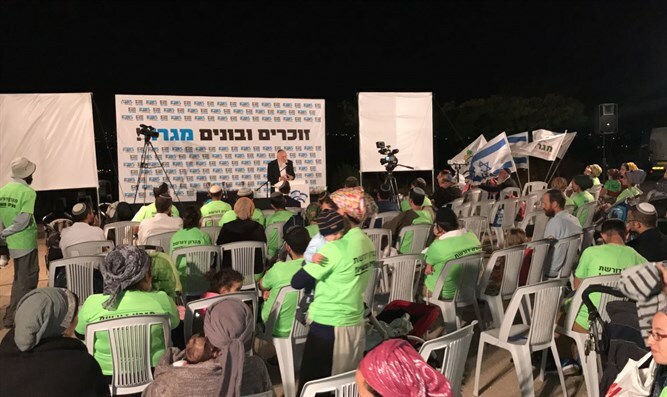 Hundreds of Jews participated on Sunday evening at a rally marking the fifth anniversary of the destruction of the community of Migron in the Binyamin region. The rally was held under the title "Remembering and Building – in Migron", and was attended by Environmental Protection and Jerusalem Affairs Minister Ze'ev Elkin (Likud), MKs Bezalel Smotrich (the Jewish Home) and Miki Zohar (Likud), and the chairman of the Binyamin Regional Council, Avi Ro’eh. The evening began with the Minister and the MKs signing the “Migron Charter”, which calls for the implementation of the plan for permanent construction of Migron, and was followed by a performance by the residents of Migron. Elkin, the MKs and Ro’eh then gave speeches. Migron was demolished on the order of the Supreme Court in 2012, and many of the former residents have been without permanent housing for the last five years, despite repeated promises to build them a new community. Prime Minister Binyamin Netanyahu recently stated that construction for the new town for the residents of Migron would be approved by the end of this month. "There is no reason why construction for Migron should not be approved in the next meeting of the Civil Administration’s Supreme Planning Council," Elkin said in his remarks on Sunday. "I am committed to this as a Minister and a member of the Cabinet. There are several issues that need to be resolved. I hope that we will reverse our failures at Amona and Migron, and we will see a competition between the two communities over which will be established more quickly, and with the help of God in the next year the two communities will be established." MK Smotrich said, "Five years of unfulfilled government promises are an intolerable reality. We should have made this demand years ago, and it is good that we are doing it now. We must say clearly: The excuses are over." "If the plan for the permanent community in Migron is not approved at the upcoming meeting of the Planning Council, we will push to pass the law that we have already placed on the Knesset table and which determines that the promises must be fulfilled," Smotrich continued. MK Zohar said, "Here on this mountain, a great deed was done by the Jewish people who settled the land. We begged them to vacate the place. We asked them to vacate the place because of a wrongful decision, both by the Court and by the legal system in general here in the State of Israel." Finally, Zohar turned to the Prime Minister and Defense Minister and said, "The time has come to solve the matter. The time has come to settle the land, because we have no other country."